I looked through over 50 membership sites to figure out what the most common membership levels and payment options were. I looked at everything from clubs (Ex. Old Dominion Boat Club, The Hunting Hills Swim Club, etc. ), associations (Ex. Washington State Massage Therapy Association, Canadian Society of Children’s Authors, Illustrators and Performers, etc.) nonprofits (Southern Business Women’s Network, Sustainable Tallahassee, etc. ), chambers of commerce, businesses, and more. What I learned, is that regardless of what organizations call their membership levels (things like Champion, Patron, Platinum, etc. ), they all boil down to the same basics. In this post, I’ll go over the four most common methods of determining membership level names and their pay structure. By the end of this post, you should feel confident about setting up your own membership levels in the best way for your organization. 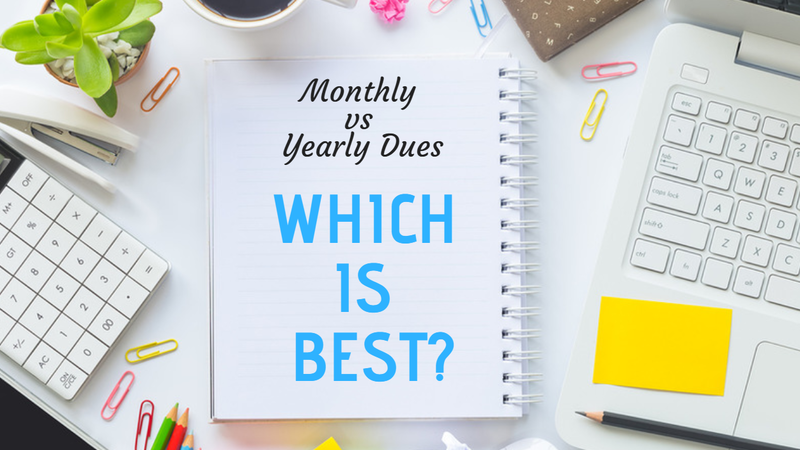 But first, a note about whether you should provide monthly or yearly renewal options. Monthly vs Yearly Member Dues — Which Is Best For Your Organization? Out of all the organizations I analyzed, the only ones that offered monthly dues were ones that offered transactional value, like lessons, courses, and mentorship. Not surprisingly, these were often for-profit businesses. That’s because offering monthly membership gave members the ability to cancel their membership once they felt they’d learned enough — something not typical of nonprofit organizations who want to create a sustained relationship with their members. You can charge full price (yearly membership is often discounted). Many prospective members may pay for the first month just to see what it’s like (less risk for members). It’s easier to tell if your activities and the value you offer your members is working, based on whether they keep renewing or now. You may make less revenue if a member decides to leave half-way through the year. It can be difficult to forecast how many member you’ll have by the end of the year. Most clubs, professional associations, chambers of commerce, and nonprofits are set up to collect yearly dues. A boost in cash flow upfront. Often organizations will even offer the ability to pay two years upfront for a discount. It’s difficult to tell which members are engaged as a member may lapse halfway through the year, but you only find out when they don’t renew their membership at year end. If you’re new to collecting dues, they can be the most time-consuming task for the administrator of your organization. That’s why most membership organizations use online software automate the process entirely (collecting payments, and automating renewals, reminders, and invoices). If you need a software suggestion, Wild Apricot is the number one membership management software used by over 20,000 membership organizations around the world. Many of our customers report saving over 20 hours a week from letting it handle all their administrative tasks. 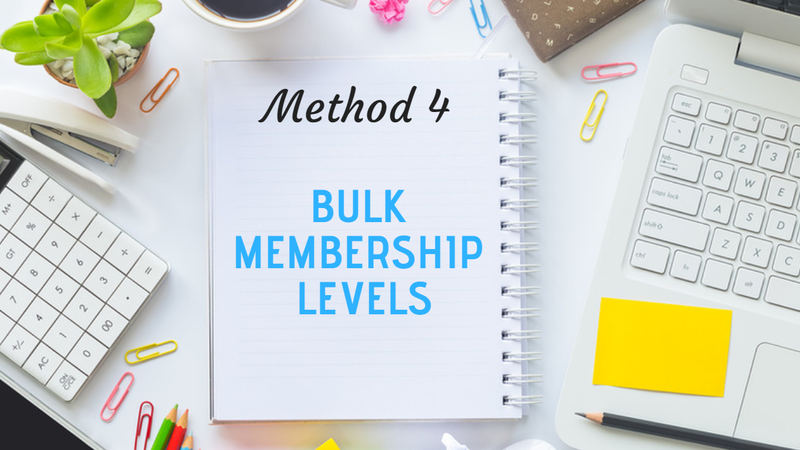 Now it’s time to move on to the four most common methods of determining membership levels and pay structure. Depending on the value your organization offers, you may choose to go with only one of the follow four methods, or a mix of your choosing. This method is most often used by smaller organizations that offer similar value to all their members. For example, the Southern Business Women’s Network, an organization of about 300 members has a flat rate of $55 to become a member. Benefits include advanced notice of upcoming events, special member offers, a free listing in the member directory and a few other perks. Other organizations I’ve seen take this approach include small clubs or localized associations. Below are some of the common levels I saw from organizations who take this approach. Missed opportunities to collect more dues from very-active members, or professional members. It’s difficult to segment members since they’re all grouped in the same category. When creating your membership application form, I recommend asking a lot of demographic and interest-based questions to help segment these members in your database. This method is used by organizations that offer many different member benefits, especially if some premium member benefits cost a lot for your organization. That’s because it allows the organization to charge members more for extra benefits. In this method, members choose what type of member they’d like to become based on the benefits offered. Many large associations use this method for their sponsorship members. For example, the National Association of Specialty Pharmacy charges $250 for an individual 1-year membership, whereas they charge $35,000 for their Palladium Corporate Membership, which includes a huge amount of benefits for corporate sponsors. Another example is the Twin Cities American Guild of Organists, which charges members different rates depending on whether they want an online or print subscription to their newsletter, Pipenotes. Below are some advantages and disadvantages of taking this approach. Keeping track of which members get which benefits can be complicated. Member gets email updates and event invites. Limited access to member benefits. If you’re a nonprofit, it’s a good idea to review your articles of incorporation to see how this membership level affects your status (non-voting rights). Access to the most common member benefits. Full access to all member benefits and extras. This is the the most common approach I saw taken. However, it can get a little messy, especially for large professional associations, who cater to a wide variety of members. Rather than members choosing what type of member they’d like to become, the organization chooses for them based on the member’s age, career, or education. I saw this method employed most in organizations that serve a community, or associations where education level is a primary identifier. For example, the Nassau Swim Club charges different rates based on a members age, whether they are a staff, or if they graduated from from a certain school. Another example is the Canadian Sport Massage Therapist Association, which charges different member dues for students versus certification candidates. Segmenting members and their benefits is very easy as members self-identify who they are. For example, if you want to run a student event, your database will tell you exactly how many students you have and make it easy to market to them. You can charge higher dues for industry professionals. It’s difficult to keep track of how members change. For example, when a student graduates and starts working in the industry, they should start paying dues at the professional level, but this can be difficult to track for thousands of members. Special member rate for children. Most often used by clubs (ex. Swim club). Discounted rate for high school/college students. Introducing students to your professional association can boost revenue when they graduate and become professional members. Discounted membership for those who aren’t professionals, but are interested in networking in your industry. Often organizations will restrict some benefits to these members. Premium rate for industry professionals. Often this level gets the most benefits. Discounted rate for senior citizens. This method is employed by organizations that see a lot of people signing up at once. Often family-oriented clubs or business associations use this method, because it’s more attractive for groups of people to sign up for a discount than individually at no discount. For example, the Bicycling in Greensboro charges $35 for a basic individual membership, or $45 for a bundled family membership (members choose the best option for their situation). It’s easier to attract parents with children, or employers who want their employees to be part of an association or access to training with discounted rates. If you’re completing member registrations manually (or in Excel), figuring out who’s on which bundle is a nightmare. Below are some of the common levels I saw from organizations. Regular membership for one person. Discounted rate for multiple people joining at once. Discounted rate for groups. Often given when small staff teams want to join together. Premium rate for organizations or sponsors to join the organization. This membership level often gets benefits tailored to them. If you have sister organizations, or chapters in multiple cities, a multi-membership is a premium rate (while still providing an overall discount) that allows members access to more than one organization. For example, if the standard due for membership is $50, membership at two chapters could be $75 ($25 off $100 total dues). A very large due that gives a member lifetime access to your member benefits. I’ve seen some organizations charge over $1,000 upfront for a lifetime due. Most membership organizations use software called membership management software that helps them set up custom levels and automate the entire payment process (registration, database update, invoicing, etc.). Membership Management Software is an all-in-one solution that can also automate hundreds of other administrative tasks such as event registrations, website updates, database updates, finances, newsletter emails, and more. It saves some organizations up to 20 hours a week in administrative work. If you'd like to see how much time and money membership management Software can save you, start a free trial of Wild Apricot, the number one Membership Management Software on the market used by over 20,000 organizations around the world. me>You can get your free trial here. All the best with setting up your levels!